Each and every morning looks just about the same in terms of what I eat. With my breakfast, I have a healthy and nutritious juice and vegetable shake and it is an absolute breeze to put together and I eat more vegetables and fruit in one sitting than I used to in an entire day. It has a 64 oz container which allows you to create larger batches of your favorite Vitamix recipe. 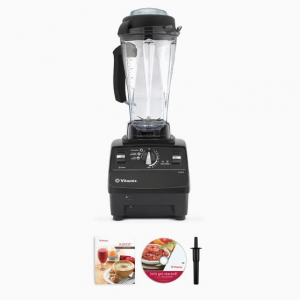 The Vitamix 6300 is a commercial grade, 2 horsepower blender that drives a blade up to 240MPH. This liquefies the toughest of the tough, from bones to avocado pits! It creams, chops, churns, and even heats all within a single unit. It is sheer power and in I am going to be walking you through some of my personal “favorite” aspects of the Vitamix 6300 within this review. I used to quite regularly buy “juices” from the market and the grocery store (Oswalda, Happy Planet, etc). A small container of these juices could cost me up the $9 per and would only be enough for one serving with my breakfast. Over the course fo the month, these add up very quickly. On averages I as spending $100+ per month on these juices, not to mention heading out to a juice bar to grab a juice or buying pre-made protein shakes. Here is a sample shake that I made just the other day in my Vitamix. All of these things (and much more) can be done with raw ingredients in the Vitamix 6300 and you can literally liquify pretty much anything (even rock hard avacado cores) into a healthy, delicious drink (and do so for much cheaper. In fact, I worked out the other day that the average shake that I make costs me less than $0.90 and this is using primarily organic ingredients…which as we know are much more expensive. That is 10% of the cost of the drinks I was buying from the grocery store and a heck of a lot more healthy. Peanut Butter. Guacamole. Unbelievable Baby food. Salsa. Ice cream. Protein Shakes. Pasta Sauces. Bread dough. And Even Soup! Yeah, the friction from this high powered blender actually will not only blend up beautiful tasting soups, it will heat them up so they are ready to serve. From Vegetables and spices to a healthy soup in less than 10 minutes. Just like momma’s home cookin! There are so many things far beyond just the”juicing” that you can whip-up in your Vitamix 6300 and those are just some of the more common ones. There are a lot of recipes online where you can actually watch people with their Vitamix (check out Youtube), put together their favorite recipes and walk you through them. The Vitamix website also has a number of recipes that you can follow. 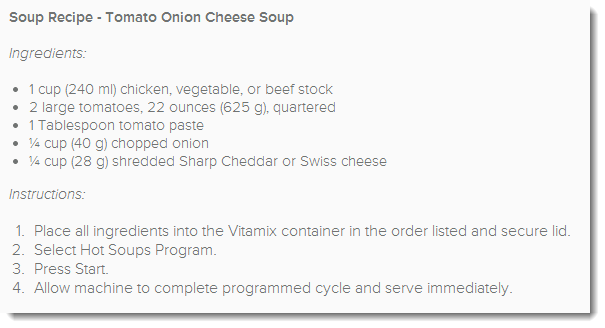 Here is just one example recipe of a Tomato, Onion & Cheese Soup (only 93 calories per serving). So it is great for juice, but it can offer you ideas for every meal throughout the day, including deserts! Cleaning Up is a Breeze. To put things into perspective, this is the 3 step process of cleaning up. Step 1: Put in a “drop” of dish soap and warm water Step 2: Run Vitamix on high for 30 seconds Step 3: Flip upside on towel to dry It really is as simple as that. And after a lot of use and blending all sorts of foods, one thing that I do to keep mine clean of any residue is to occasionally run some vinegar with water through it for 30 seconds. Cleans it up brand new. It really is low maintenance and there is never a need to have to fumble around with putting it in the dishwasher. I am a believer in this product and I know many others that absolutely LOVE their Vitamix. One definitely drawback is the upfront costs to invest in a blender of this quality, but you do get what you pay for in this case. It comes backed with a 7 year warranty and it is not a throwaway like the $200 blenders tend to come. For the sake of your health (and potentially your families), eating foods that don’t come out of a box or a package and are raw ingredients are only going to do your health a favor…plus your taste buds. If this sounds appealing to you, I highly recommend that you pick up your own Vitamix. Costco runs offers on them all the time (if you have a membership), and if you are a big online shopper like myself, Amazon has the best deals on this blender. I hope you enjoyed this review and if you have any questions about the Vitamix 6300 or want to leave your own personal review, leave a comment below. I have a Blendtec and absolutely love this blender. It is slightly less expensive but I think the quality of the unit is the same as the Vitamix. One of the great things I love about the whole juicing movement is that it has encouraged my family to drink less boxed juice and more whole blended juice. I can even sneak in some Kale so the kids can get some greens! Question: How loud is the Vitamix 6300? My Blendtec sounds like a jet taking off so I am wondering if the Vitamix is any quieter. The BlendTec is definitely the main competition for Vitamix and they two are usually said in the same sentence when it comes to the best blender. The Vitamix is also fairly loud and I don’t think there is much you can do about it, when there is that much power (2hp), you are going to get some noise. It is a small sacrifice to make for something that can liquify foods so quickly. Glad you are enjoying the BlendTec, I have heard great things about that as well. PS. I love the Kale idea as well, you can be sure that the little one is going to be growing up on “snuck in” greens. Yeah, I personally wouldn’t go to anything else now that I have used the Vitamix (and do so every day). It has become part of my daily eating routine and although I don’t get crafty and make things like peanut butter too often, I know many folks that do. If the nutrabullet is working for you, I suggest you continue using it…but if you are looking for something a bit more powerful and with a larger holding capacity, you should definitely consider the Vitamix. Juicing and making smoothies is one of the most beneficial health options and is fortunately catching on. And yes, it certainly does not take long for a quality blender like Vitamix 6300 to pay for itself in lieu of the cost of regularly purchasing juices/smoothies. And not to mention most of the juices that you buy at the local franchises are not all that healthy for you to begin with. Lots of them use powders or non-organic vegetables and on top of this, they are very expensive. This is one scenario where I would truly say that you get what you pay for and my Vitamix has paid for itself 10x over in the last year alone. Never heard of it, but I imagine that the Vitamix 6300 would whip this up nicely. I have made things like Peanut Butter (although not quite Pine Needle Tea) in a Vitamix and it turned out brilliantly. Love, love, love my Vitamix 6300. I have been making smoothies for the past 2 years and I have actually lost close to 30lbs simply because I can create very filling and nutritious shakes without much effort. One thing that the Vitamix does is make getting your nutrients very easy to get, from the vegetables and fruits to the proteins. Sometimes I throw together a protein shake after my work out, banana, coconut water, peanut butter and protein powder. So good. Can’t live without my shakes and I have been using this thing literally every day and there is no wear whatsoever on it (blade is showing NO signs of wearing out). Well built units. Yeah, the Vitamix is an excellent device for protein shakes too. I am more of a fruit/veggie smoothy sort of guy, but I definitely know a lot of people that use theirs for protein shakes (even whip up a few days worth at once) and also for soups. So awesome to hear it helped you change your dieting “patterns”, it happens so naturally because when you start throwing vegetables into your shakes, it kills your appetite because of the fiber and nutrition. Definitely not empty calories and you could literally be content for an entire day off of three big shakes and a few servings of protein. I usually do that when I am trying to cut down. A 7-year full warranty? Wow, they must be really confident that this blender is going to stand the test of time. It’s quite rare to get a warranty that long, isn’t it? You are definitely right, though. Fresh juices made like this are far better than juices you buy in shops. They will be filled with additional ingredients you don’t want, like preservatives and added sugar. Besides, there’s no way there will be as much nutritional goodness as you get when blending fresh fruits and vegetables, that’s for sure. Just one question, though: how likely do you think you are to get too much fruit sugar from having this kind of juice? Or does having all the fiber make all the difference? I have had my Vitamix 6300 for over 5 years now and it hasn’t put a dent in its performance. It still looks like new and operates just the same. Too bad more small appliances and blenders could not be built the same way, it is almost like manufacturers build things with the intention of making them only last a couple of years. The awesome part about the juices we make with a Vitamix is that we throw the fruit in, skin and all (obviously not oranges though). Much of the nutrient and fibre is within the skin and that is what you will miss out if you have a normal juicer (which cuts out the pulp). In response to your question, the shakes I usually make are full of vegetables. I would say they are about 70% vegetables (spinach, carrots, ginger, kale, celery) and 30% juice. So definitely not too much sugar in them. Even if they were 100% fruit, it still would be much better than most of the alternatives we would be eating out there! Great review. I felt you were addressing me personally while reading it. How good is the vitamix and blending really tough hard raw vegetables like broccoli, potatoes, and parsley? Also rather interestingly, how does it cope with chopping up and liquefying fruit skins and rinds? That is where some awesome hidden nutrition is in some fruits, especially watermelon. I think this post could have naturally been directed at many people, most people are amazed when they see how the unit works and that is why they actively have Vitamix demonstrations in places like Costco to show the power of this machine. It blends up ANY fruits and vegetables no problem. I put in fruit with the skin on as well as that is where a good deal of the nutrition is and it completely liquifies it. You can turn it into soup if you want as well, by leaving the blender on a little longer the friction of the blades will actually heat up your blended mixture into a warm soup. Brilliant. I remember in the demonstration I saw, they took an avacado core and blended that up until it was a liquid. Just to show the power, a skin or rind isn’t difficult at all for this machine to process into a liquid. Thanks for the in depth review! I am a big fan of blending since I workout often! I have been through many cheap blender and wasted a lot of time “pulsing” the blades and having sub-par quality texture and taste. However I did buy the ninja blender and it is pretty awesome, but annoying to clean. How easy is the cleaning process for this? It seems like lots of people I talk to these days have the Ninja blender, they must be on a marketing blitz right now. I don’t think there is any real comparison between the Ninja and the Vitamix, perhaps and idea for an upcoming post and review. The cleaning process for the Vitamix is an absolute breeze. You put a drop (literally) of soap in, you blend it for 30 seconds, it is crystal clean. I typically take the unit and just wash it out with warm water after blending a smoothy and that is more than adequate to get it clean, following by a good clean usually once per week. This is a great article. The vitamix is a great blender/juicer. It does absolutely everything! Hi have a ninja, and I love it, but I don’t think it does as much as the vitamix. Everyone I have ever talked to who has one just loves it. I should really invest in one when my ninja goes! I have definitely heard good things about the Ninja as well. It doesn’t get quite the same sort of reviews as the Vitamix, but it is definitely a quality device as well. When the Ninja goes down, you can definitely consider the Vitamix. I have the 6300 and I absolutely love it, though I believe there are several newer models now. 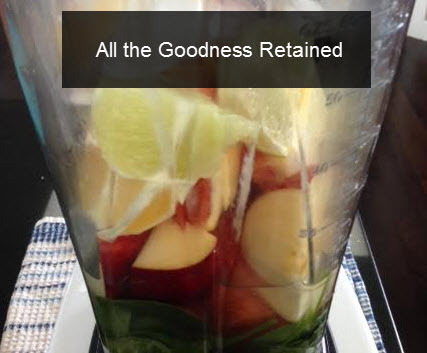 Thanks Kyle for the very honest and helpful review of the Vitamix 6300 blender. Our family has never used a blender this advanced. Not that we use blenders all that often anyway, but I can understand the huge benefit of having a quality machine like this on hand that will satisfy your blending needs for many years to come. Are there any other blender models from Vitamix that you would recommend for people with a smaller budget? To be honest, prior to the Vitamix I didn’t use a blender…ever. The problem was in part to the clean up process, pulling it out of the cupboard, and the actually blending was of the power or quality that could actually create juice (that wasn’t chunky). In the blender space, the most popular and the top devices are either the Vitamix and Blendtec. They are the industry leaders and you will find that any blender enthusiasts will choose between one or the other. I absolutely love this machine. Sometimes you have to pay more to get quality, definitely worth it with this juicer I believe! Being a neat freak, I like the fact that it cleans up easily. That is kind of a factor for me in any kitchen items I buy. I also like that I can get lots of recipes that I can immediately start using! Great post! So glad I stumbled across your website! I agree, you get what you pay for sometimes and that is definitely the case with the Vitamix 6300. There have been many times I have had company while using my a Vitamix and they were amazed by the sheer power and easy of use of it…not to mention the simple clean up. It is definitely a staple in our kitchen and I feel that at that, we underutilize it for its full capabilities. The healthy way to juice is blend, and the best way to do it is with a vitamix where you get all the fiber of the whole fruit not just the juice that comes from it. A vitamix is pricey but worth it. They make nutritious shakes and it is a great way to get more fruits and veggies into your diet. The blades go up to 240mph. Now going to a juice or shake bar will cost you a fortune every month. And buying juice and making shakes with a blender is okay, but you’re not really getting all the nutrition you could because you’re not using the whole fruit. If you buy a vitamix, yes it’s a big cost upfront, but will save you in the long run and will provide much more nutritious smoothies than you would ever get otherwise. If you buy a smoothie a day at the smoothie store at say $8 a pop, that’s $240 a month. 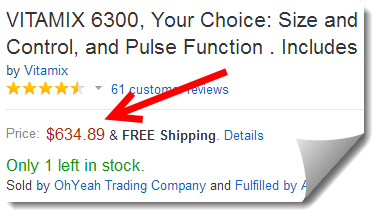 You can buy a Vitamix for $649 on Amazon and in 3 months you’d have paid for it with not having to pay for smoothies at the store anymore. Of course you will still need to buy the ingredients, but you would need to do that anyway. But you can make more than just smoothies. You can make pasta sauce, salsa, guacamole, baby food, ice cream, bread dough, your own nut butters, and soups. There are tons of recipes online for Vitamix users. Cleaning is a matter of adding a drop of dish soap, some water, turning it on, dumping it out, washing it out with clean water, and turning it on a towel to dry. Plus it has a 7 year guarantee. Exactly, although there is an upfront cost (which is more than other blenders), the Vitamix can pay for itself very quickly not just in terms of your finances, but also the huge health benefits as well. I haven’t delved into many of the things like pasta sauces, ice cream, etc as it is more a smoothy machine for us, but I know that people absolutely love it for many different reasons and I know someone who makes organic peanut butter in their Vitamix frequently. I’ve been searching for a blender that I would use to mix my juices each morning before university. I’ve read a lot of articles saying how bad the bought juices are and they do make sense. The amount of sugar that’s in there is just insane. This Vitamix blender is quite expensive for my taste. It’s true that it comes with a 7-year warranty but I just can’t afford an investment like this at the moment. Do you have any suggestions on any cheaper blenders that are still good and won’t break the next week? It is quite expensive, but compared to a commercial juicer or even some of the “mid range” juicers, it is actually fairly priced. One thing that I do like about the Vitamix is the versatility of the blender, you can make everything from peanut butter to your favourite soups very quickly. Not to mention all the of the full rind and even skin juices that you are going to be able to liquify using the Vitamix. The cheaper blenders will do the job, but from my experience they will tend to break and overheat after a year or two so there is a limited time frame in which these are going to last.